As we mentioned in our first post of this newly opened restaurant located on 1st Avenue and Renfrew Street in Vancouver, Buddha Boy would like to give it another chance and try its dinner dishes. So, here we were...dragging along MomJ for the experience. 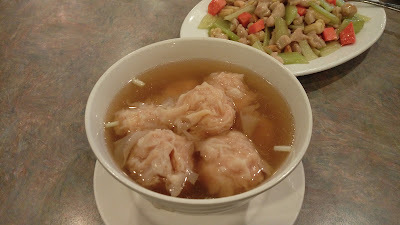 Our meal started with a bowl of Wonton in Soup 淨雲吞, something Buddha Boy enjoyed last visit and wanted MomJ to try. 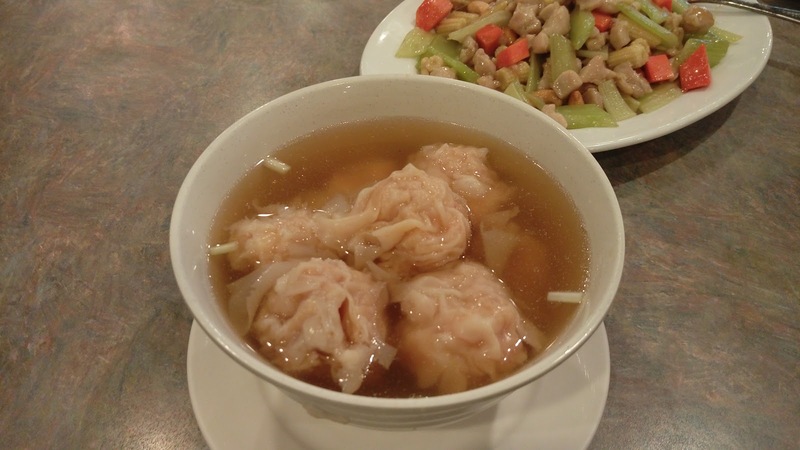 Unfortunately, the wontons were overcooked and the broth was overly salty. 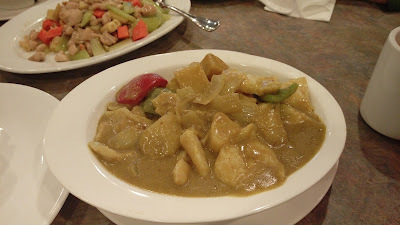 We were hoping the restaurant had some kind of mix & match dinner combinations 合菜 (和菜), but we didn't have much luck. 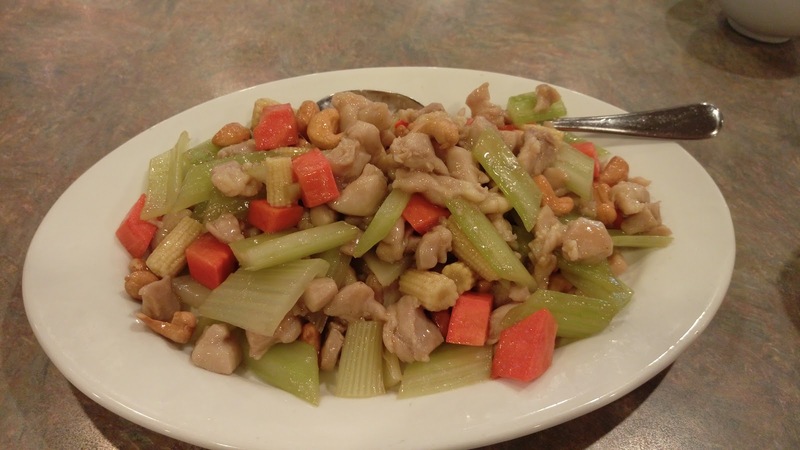 So off the regular menu, our first dish was the Pan Fried Diced Chicken with Cashew Nuts 腰果雞丁. The dish lacked wok-hei 鑊氣 and the seasoning was a bit bland. Other than that, the portion was decent with sufficient amounts of chicken, carrots, celery, cashews and baby corn. 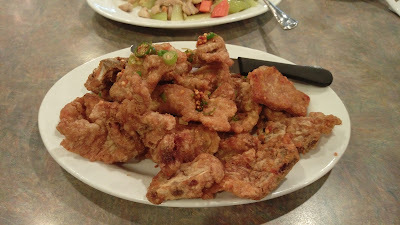 The Deep Fried Pork Chops with Spicy Salt & Chili 椒鹽肉扒 seemed like a large dish but there were a lot of bone pieces. The meat was flat and tough with no pork crunch. The amount of salt and chili mix was small, hideous and useless. This was depressing. 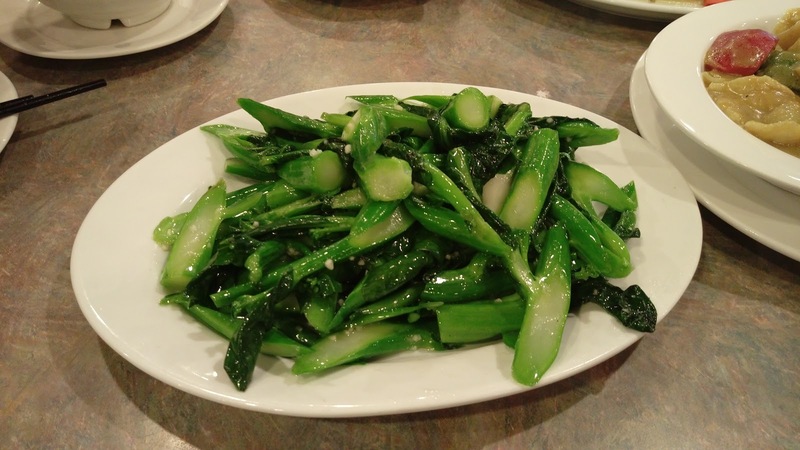 With no pea sprouts, we changed our order to Sauteed Kai Lan w/Minced Garlic 蒜蓉炒芥蘭. The greens were too ripe and overly fibrous. Thank goodness I requested to have the vegetable cut into smaller chunks or else our teeth would be working really hard to make the bites. For carbs, we had the Singapore Style Curry Fried Rice Vermicelli 星洲炒米, one of Buddha Boy's benchmarks at any new Chinese restaurants we visit. This dish reminded us of the ones we've tried at Boston Restaurant 波士頓餐廳 or Sun Tin Day Cafe 新天地餐廳 where the portion was big but the dish lacked wok-hei 鑊氣 and quality was dull. Other than the only evident taste of curry powder, salt was lacking to enhance the essential aromas of common ingredients/toppings. 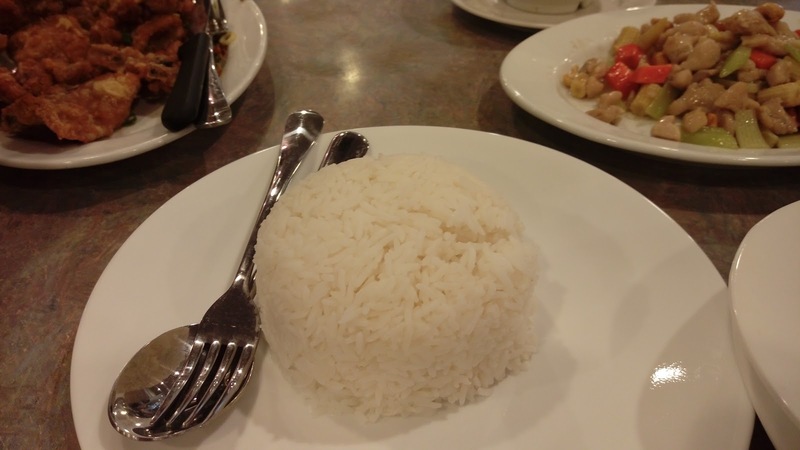 MomJ ordered a Curried Seafood Medley on Steamed Rice 咖哩石斑飯. "Seafood Medley", as stated in English on the menu, was misleading as this only had chunks of cod fillet with potatoes, bell peppers and onions. However, that being said, menu item was listed correctly in Chinese. 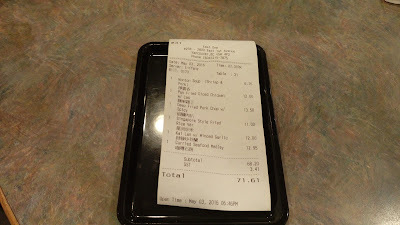 Even though there's no mix & match combo dinner deals, complimentary desserts were served. 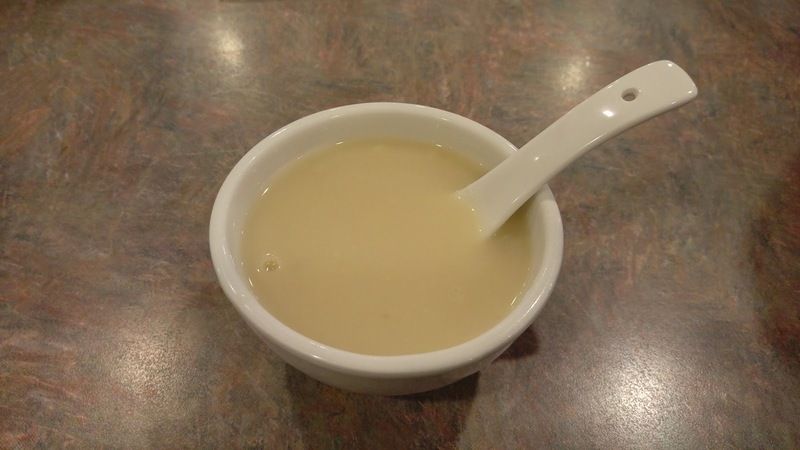 The Mung Bean Sweet Soup 綠豆糖水 was overly sweet and watery. There were plenty of servers in the dining room but service was skimpy and thin. Of course, if you're like the table next to us who knows the owners. you wouldn't have a problem with its service because there's constantly a mob of servers/management waiting to serve you. We've tried its lunch and we didn't like it. We've tried its dinner and we didn't like it. 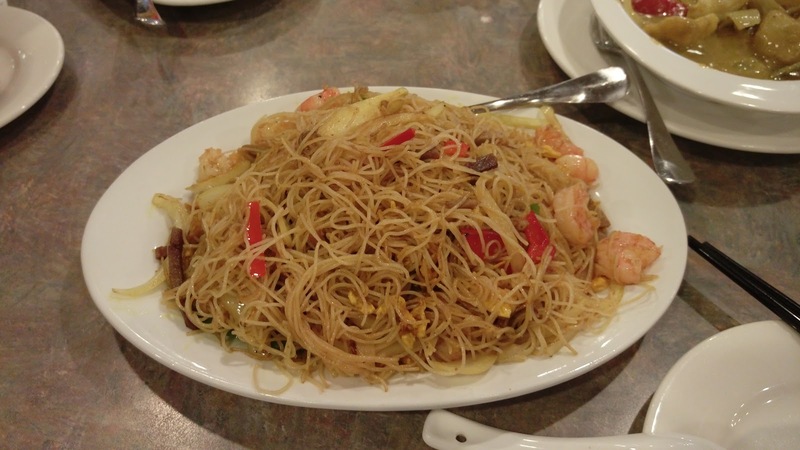 Almost every dish we've tried lacked adequate seasoning and wok-hei 鑊氣. Higher than usual price points did not match its food quality/quantity. We've been there and done that. Not returning.